A human will still operate the self-driving car for safety reasons, but customers will interact mostly with the vehicle. Getting a pizza delivered in Miami could soon require no interaction with a human. Ford Motor announced Tuesday that it would launch a service to test self-driving food delivery in Miami. The partnership includes a two-month pilot period with Domino’s Pizza, as well as a similar budding alliance with delivery service Postmates. Vehicles will be outfitted to look like there’s no driver, but there will actually be one. That will allow the companies to study human interaction with a seemingly driverless car delivering food. Ford will also test actual self-driving vehicles at the same time as it continues to pursue commercially viable technology. The move comes after a small-scale test in Ann Arbor, Mich., where Ford and Domino’s briefly collaborated on pizza delivery. Both companies are headquartered within a 30-minute drive of each other in Michigan. 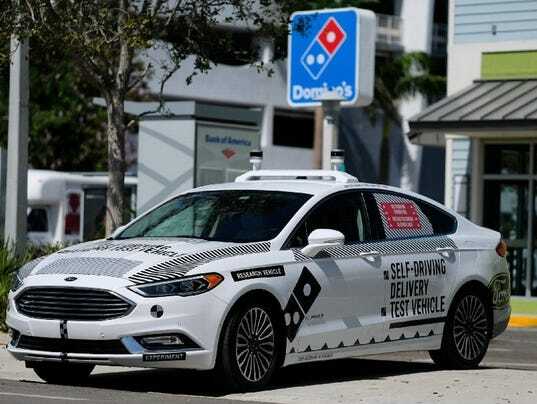 In Miami, Ford and Domino’s expect to glean insights from maneuvering around a more urbanized environment. Ford said it expects to translate the information gathered from the project into a real-world self-driving vehicle in 2021. “After … developing different techniques to navigate a future of self-driving cars, we’re heading onto the stage in Miami-Dade to see how our business performs,” said Sherif Marakby, Ford’s vice president for autonomous vehicles and electrification, in a blog post. While a significant next step for Ford, the timeline indicates that Ford remains behind the auto industry’s leaders in driverless cars. Former Google car project Waymo already runs a self-driving car service for consumers in Phoenix, while General Motors is testing self-driving cars in San Francisco and expects to begin a similar service by 2019.